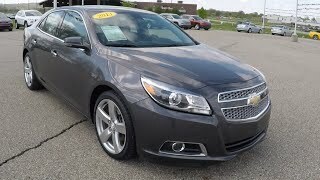 Check out the 2013 Chevrolet Malibu LTZ after the jump. Founded in Detroit in 1911, Chevrolet celebrates its centennial as a global automotive brand with annual sales of about 4.25 million vehicles in more than 140 countries. Chevrolet provides consumers with fuel-efficient, safe and reliable vehicles that deliver high quality, expressive design, spirited performance and value. The Chevrolet portfolio includes iconic performance cars such as Corvette and Camaro; dependable, long-lasting pickups and SUVs such as Silverado and Suburban; and award-winning passenger cars and crossovers such as Spark, Cruze, Malibu, Equinox and Traverse. 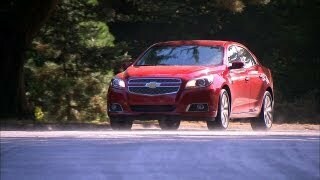 Chevrolet also offers “gas-friendly to gas-free" solutions including Cruze Eco and Volt. 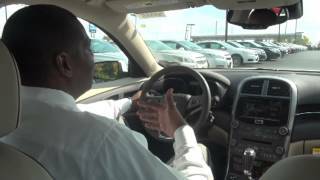 Cruze Eco offers 42 mpg highway while Volt offers 35 miles of electric, gasoline-free driving and an additional 344 miles of extended range. Most new Chevrolet models offer OnStar safety, security and convenience technologies including OnStar Hands-Free Calling, Automatic Crash Response and Stolen Vehicle Slowdown. More information regarding Chevrolet models can be found at www.chevrolet.com.